Read all about my adventures in Ahmdebad in my guest post for Ethical Hedonist. I do love an elephant! My intrepid 6 week journey starts at 5am, one very cold morning in November, packed and ready to head to LHR for the first leg of my flights to the glamorous yet equally impoverished city of Mumbai. Thankfully, my eco chariot arrived right on time, a cosy, comfortable and all importantly environmentally friendly Green Tomato Car (www.greentomatocars.com) taxied me and my entourage to the airport in luxurious sustainable style. The initial journey ends the next day at 5am India time when I arrive at my dwelling in Mumbai, ready for a short rest before my first meeting with a new embroidery unit I have been introduced to, later that day. When I made a decision to monitor as much of my supply chain as possible it seemed a fairly impossible task, but 8 years later , having visited every one of my long term producers countless times and aiming to visit a few more potential suppliers on this trip I feel confident that it can be done – to be able to see the people making my fabrics and embellishments, with care, dedication and true craftsmanship is one of the joys of working this way, it turns a notoriously faceless product into a beautiful story of people and individuality. So I was rather taken aback as I arrived at what appeared to be the home of this new supplier, though not unusual for offices to be in old flats and colonial buildings in India, this appeared to be where my new supplier lived – a beautiful old house in the heart of Malabar Hill, one of the wealthier districts of Mumbai. I was invited in to a large but sparse and faceless room, where I was (uncharacteristically) not offered even a glass of water and then shown a load of samples of embroidery and bead work extracted from one of the cupboards to line the walls. The beautiful swatches were lovely, but not unlike other work I have seen on my travels and the experience was marred by the fact that the workers (who I had pointedly asked to be able to meet, and been told they worked from the same place, prior to my visit) were on their one month holiday for New Year. But I was allowed to see the much too small room all 20 of them were expected to work in 6 days a week, from 8am-11pm, all 11 other months of the year (!!!!!!) In my disappointment at not being able to see the work being done and enquiring about the sampling, I had until that point been planning to do, the very charming face of this company told me her other unit was still working, but it was 2 hours away. Great I said I have all day, lets go. But alas, this unit is STRICTLY off limits to foreign visitors, for copyright reasons apparently…. Alarm bells started to ring and I left, making some excuses and feeling really quite saddened by the whole experience. Perhaps she was legitimate, perhaps they are working on the latest Chanel embroideries or Versace sequinned fabrics or McQueen embellishments, but so what?! Give it a few months and they’ll be all over the papers and on line anyway. If things are really top secret they can be covered up for the 10minutes I’d walk through the unit. In over a decade in the industry I have never been told I cant see a unit, no matter how bad (and some really have been!) and whilst discretion is admirable, when she has already admitted the working conditions of the employees she allows into her home and must therefore trust, how can I believe the other unit is working even close to fair trade standards? How can I know anything without seeing it?! The conundrum here is that the workers she employs, certainly the ones off on their holidays, do come back, I am sure they do take pride in their work, and the long hours they work mean higher incomes to send back to their families. Time and time again I have seen and heard of workers chosing regular employment in less secure units that offer lower hourly salary but a higher all day rate (even if the day is 8am-11pm) over fair trade employment, with all its long term benefits – because the days are shorter and therefore the basic take home salary is less. Which means fair trade units need to be able to offer longer hours to their workers, if they are to be able to keep going and keep supporting people. Its not just the salary with fair trade too, these business offer so much more – security, healthcare, profits into local communities to name a few. So as consumers it is our job to ensure they can take on more employees for longer hours, by buying fairly traded products (and if you are not sure if its fairly traded – ASK! FashionRevolution.org will show you how). Then, business like those of the charming lady from Malabar Hill will start losing their dedicated workers, to units offering them much better deals, unless they start offering them a better deal too. And that is how we make the world fair trade, in a nut shell. When it comes to high end products like the bridal and evening wear I produce, it is quite likely to be made in the UK (or whichever country you are in) unless you are buying a lower priced off the rack gown (beware of the China designer copies – you will regret it). At Tammam most of our tailoring is done in the UK at our London Atelier, but its our fabrics and embellishments that we source in India, and it is these that are just as important to check as the final stitching. So again, when you go to buy your bridal gown or prom dress do ask who sewed on the 5000 beads, and where was the fabric woven and what fibres is it made of. So many questions! It is our job to ensure boutiques and designers know the answers to these questions. So much power we have! 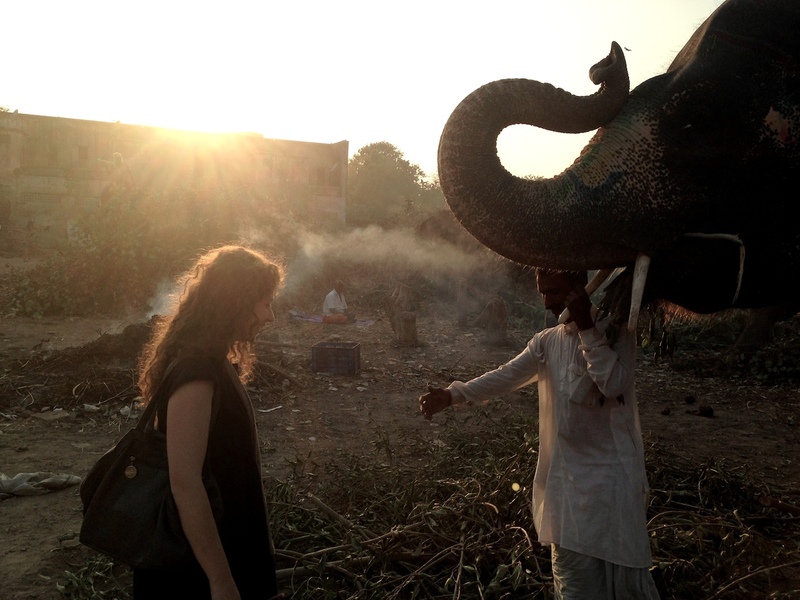 Follow the rest of my adventures in India on Ethical Hedonist.